Sorry, Aspire ET-S - BDC clearomizer has been discontinued. 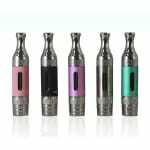 Aspire ET-S clearomizer, metal casing around glass tank, bottom dual coil, 3ml. The Aspire ET-S is the best eGo-style clearomizer (tank) out there in the market. It has a glass tank and a metal casing protecting the tank. It is a bottom dual coil (BDC) clearomizer by Aspire. The dual heating coils produce twice as much vapor than with the standard single coil clearomizer. There are no exposed wicks in the clearomizer and holds 3ml of liquid and comes with a standard 1.8 ohm replaceable coil. 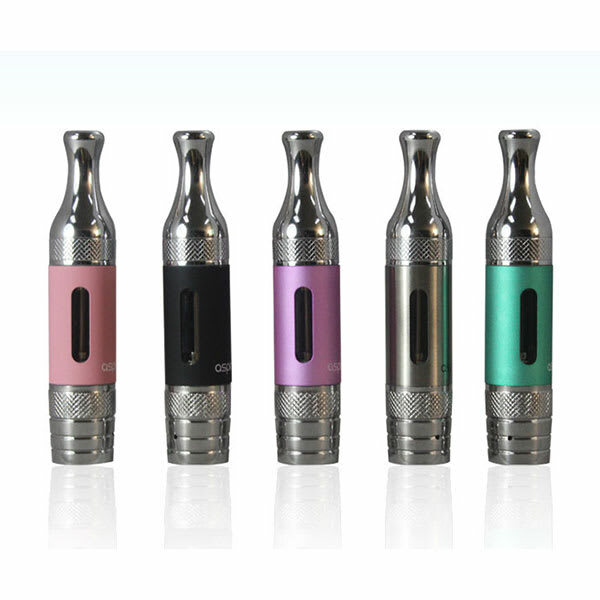 Just compare this tank with the single coil clearomizers, you will be amazed with the difference in taste and vapor production. Click here for replacement coils/atomizers. Compared to the EVOD I was using previous to this, the Aspire wins hands-down. Loads of flavour and way bigger clouds! I've tried many low-end tanks, including the aerotank v2, but I keep going back to this one... it has great vapor and great flavour, and very little spit-back, and you can crank it up to 12 watts or higher without any sort of cotton burning... most of the lower end tanks give very little smoke and once you try to increase the wattage, all they do is burn the coil. It holds 3ml of juice, which is quite a bit, so you don't have to keep refilling it 10 times a day, and the coils last about 2 weeks, and they are super cheap once they do burn out... one trick I've learned with this tank is that every once in a while the atomizer becomes over-saturated with juice and produces spitback and gargling, so all you do is turn your mod upside down and take a couple of puffs (turning it upside-down will burn off the saturated juice without any more absorption) and then just clean up any liquid around the mouthpiece end, and you're good to go. Got this tank last night, holds 3ml which is a lot, currently its still over half full and I've been using it for two days. Heats well, creates a thick cloud. Metal mouthpiece feels nicer than the plastic counterparts.